It’s been 2 months since NetherWorld Kickstarter campaign finished. During this time we’ve been working without rest on the project (especially the demo), improving several art&code aspects and rounding off the story to offer you a perfect summary of what NetherWorld final game is gonna be. We’re both nervous and excited to know your demo reactions and feedback! We wanted to post a NetherWorld progress devblog every month… Okay, we didn’t, but here’s our April-May devlog! We’re gonna kick lots of boss butts in NetherWorld, so the combat UI has been taken very seriously. NetherWorld has two different combat modes: Shooting and slapping, or in other words: ranged mode and melee mode, each one with its particular weapons (swords, shields, torches, handguns, long guns, flamethrowers…). Choose wisely according to the mess you got into. This double combat system made difficult to decide how the weapon selector should be. However, we finally opted for a quarter circle in the top left corner of the screen. Besides showing the weapon list, its rotation will allow you to change weapons and the combat mode as well. Here’s a prototype of how the circle looks when rotate (weapons and combat modes not included… yet). Another UI improvement we’ve introduced has been a damage indicator. That gives you the possibility to see how much damage you received from the last enemy hit. The damage indicator is used in several games like Dark Souls and many others, and shows up as a white bar in the player HP bar. In this way, with a quick look you’ll know if you’re gonna be fucked up in the next blow or not. Who loves our black and weird main character? In NetherWorld, nobody. But we do, so we created his first health recovery item: a red heart (wow, never seen it before! Just a tribute to the classics, you know). This will help him to survive during crazy and intense fights against crazy and grotesque bosses. If you’re wondering how the heart splits up in lots of pixels and every single one follows you, it’s simple: Vector Party! The purple vector indicates which direction the pixel has to head for to reach the player, and the yellow vector is the union between item’s center and the current pixel position. Regarding to combat system, we had to make some tough decisions such as changing NetherWorld submachine gun. We were using an MP40 model before, but finally we changed it for the classic Thompson. Why? It was all about the colors and its contrast with the scenarios: The design of this gun on pixel art is much better-looking than the MP40 one. Previously, weapons were a 20% bigger than the rest of NetherWorld sprites (comparing pixel sizes). Now we’ve decided to unify pixel size in all the game, including particles system. Due to these changes, we also modified rural areas vegetation and some specific elements of NetherWorld enemies and creatures such as the tentacles of the lovely eye shown below. Thinking about NetherWorld objects rotation, we considered that a standard rotation would clash with the pixel art “essence” of the game. That’s why we’ve been working on a truly pixel art rotation system. That wasn’t an easy decision: NetherWorld rotation system has experienced several (and important) changes during its development. In the beginning, the calculation to build a new rotated image for big objects like the gauntlet you’ll see below raised the 30k. After an optimization we got to reduce it to 10k. We also developed a system to storage the rotated images, so if we already had “Object X” rotated in a certain angle, the next time we needed it we would use the stored image instead of doing the rotation calculations again. 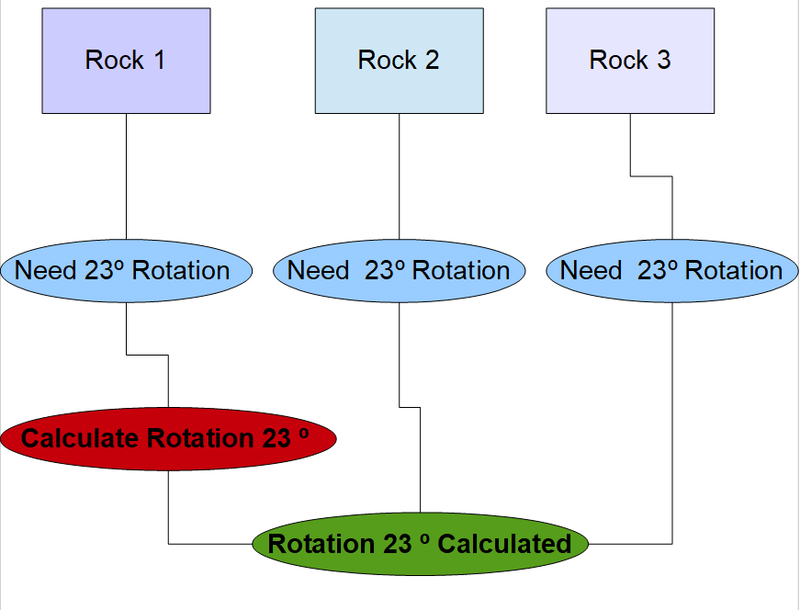 This system is very useful in a lot of cases: For example, when having objects like many rocks in the same scenario, we can have identical models subjected to constant rotations (or rocktations?). Did you know that our NetherWorld odd jellyfish couldn’t go down the stairs? Thanks to our rotation system (and some other magic tricks) now he can climb, move through irregular areas and get in buildings. And last but not least… We introduce you another tool we developed while working on NetherWorld demo: Let’s make a little bit easier the platform building! Although NetherWorld is not a platform game, we considered necessary adding some platforms during the main character journey to reduce the perception of just a flat horizontal scenario. As you can see, our platform-building tool allows you to create in a few seconds an organic structure. Once the model is built, you can also modify the parts you don’t like manually. Oh, did you arrive here? To show our gratitude we’ll give you (FOR FREE!) some ways to be the first to know about NetherWorld development!